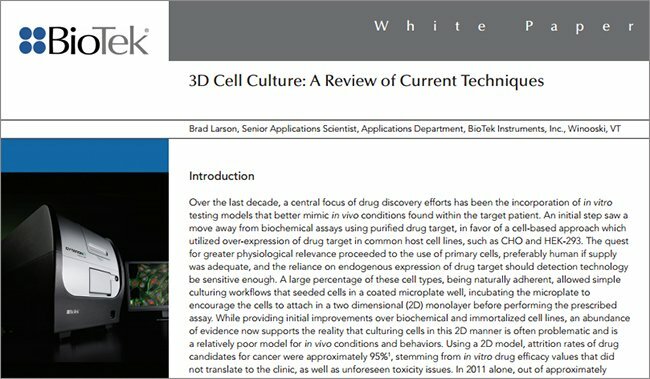 Characterization of cellular metabolism is aided by tools designed to provide ease-of-use, higher throughput, and multiplexed data markers for analysis. 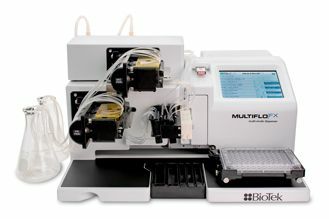 One of these tools is a group of simple mix and measure assays compatible with a variety of cellular matrices that utilize soluble, fluorescent nano sensor probes to measure oxygen consumption rates (OCR), extracellular acidification rates (ECAR), and intracellular oxygen concentration (% O2) useful to inform on cellular oxygenation and the activity of the electron transport chain (ETC) and glycolytic flux. These probes can be detected using relative fluorescence, standard timeresolved fluorescence, or advanced lifetime (μs) time-resolved fluorescence with reduced background and increased signal dynamic range dependent on the detection mode. 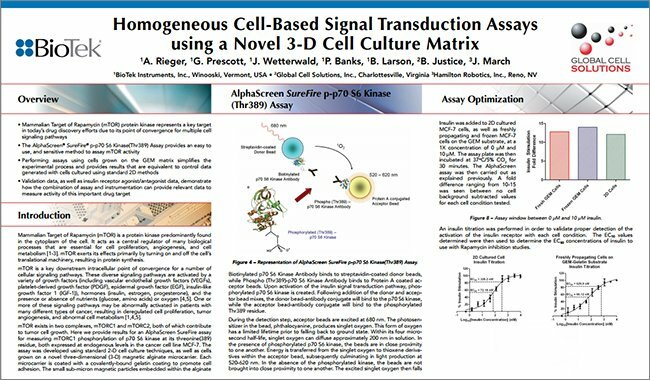 Optimization of biosensor recognition was done in microplate format using multiple cell lines and drug compound treatments. In particular, the advanced lifetime (μs) time-resolved fluorescence mode (TRF) is highlighted for generating drug compound dose response against OCR(μs/t); presenting accurate comparisons of acidification rates converted to hydrogen ion scale (ECA H+]/t); and, converting lifetime detection to intracellular oxygen concentration (% O2) in live cell 2D monolayers. 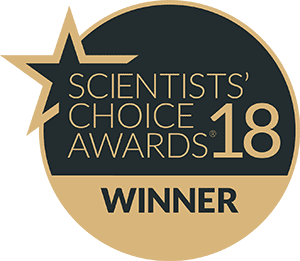 The Agilent MitoXpress® Xtra Oxygen Consumption Assay, pH-Xtra Glycolysis Assay, and MitoXpress Intra Intracellular Oxygen Assay are a family of fluorescent probes designed to aid in the study of real-time analysis of cellular metabolism in a variety of biological matrices. The probes are chemically stable and inert, water soluble, and can be multiplexed. The amount of fluorescence signal is an inverse relationship to intra- or extracellular O2 or proportional to extracellular H+ in the sample. Intracellular O2 levels (%O2), extracellular Oxygen Consumption Rate (OCR), and quantification of H+ levels and acidification rates (ECAR) are calculated from the changes in lifetime signal over time. 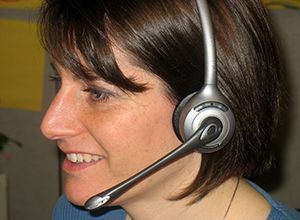 Optimal instrument settings to detect probe signal can be achieved using a validation procedure in the assay User Manuals. 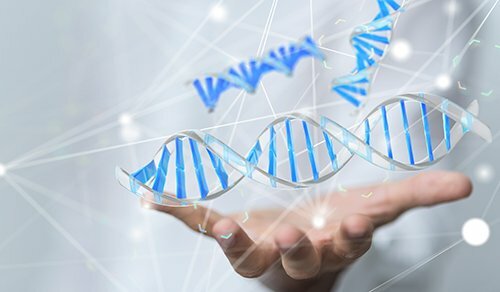 These detection parameters can then be applied to verification of cell lines, cell seeding densities, and general cellbased experiments using compound controls. 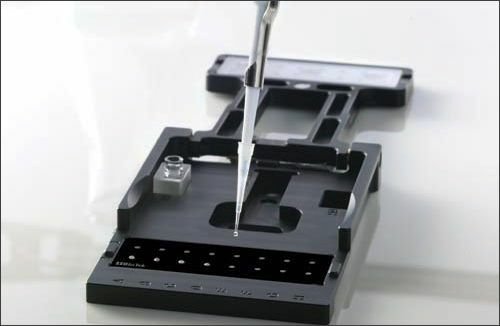 Independent testing should be conducted to optimize each cell line individually. Figure 1. Excitation and emission spectra of the pH-Xtra Glycolysis Assay demonstrating normalized excitation (A. left) and 3- to 6-fold increase in emission peak signal in response to increased acidification (A. right). A 6-fold delta at 620 nm provides an optimal window for detecting signal change in response to pH levels. (B. left). The MitoXpress Xtra and Intra probes show emission peaks at a normalized intensity of 380 nm. The probe is quenched by oxygen, and thus there is an inverse relationship between the signal and O2 levels. This is seen by a 4-fold increase of signal in deoxygenated conditions at emission peak 645 nm (B. right) compared to ambient. (C.) The dual time-resolved fluorescent lifetime detection mode that utilizes two reads at different times over the decay of the probe increases stability and dynamic range in signal acquisition. These ‘dual reads’ are used in the equation shown to calculate a lifetime signal. 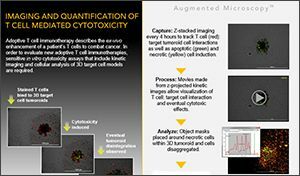 Shown with optional dispenser and CO2/O2 gas control module, Cytation 1 combines automated digital microscopy and conventional multi-mode detection in one instrument. 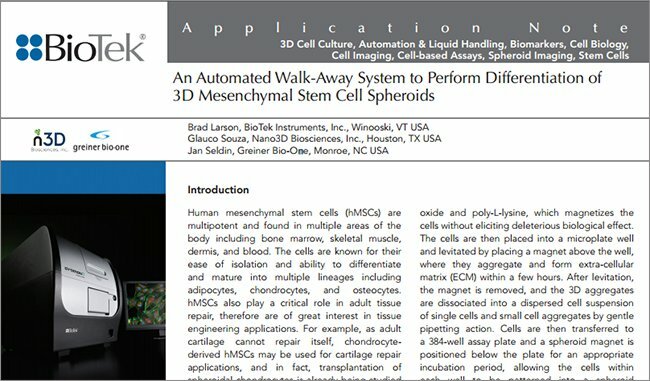 This unique, patented design, provides both quantitative phenotypic cellular information with well-based quantitative data. Temperature control and shaking are standard. 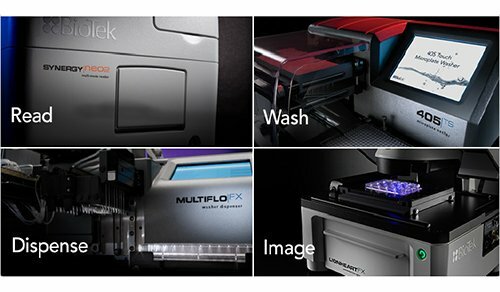 Cytation 5 combines automated digital widefield microscopy with conventional multi-mode microplate reading in a unique, patented design. 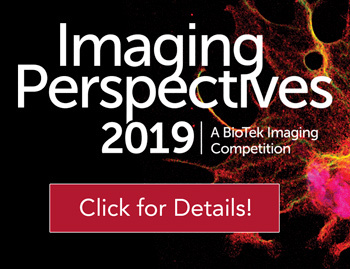 The imaging components and multi-mode optical modules are independent and physically separate within the instrument, ensuring optimized performance. 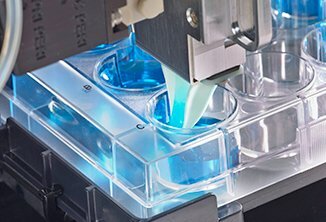 CO2/O2 control, shaking, temperature control, and reagent injectors are available to support live cell assays. 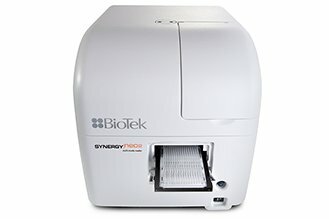 Synergy H1 Hybrid Multi-Mode Reader Synergy H1 is a configurable multi-mode microplate reader equipped with monochromator-based optics for flexibility, filter-based optics for sensitivity, or both. 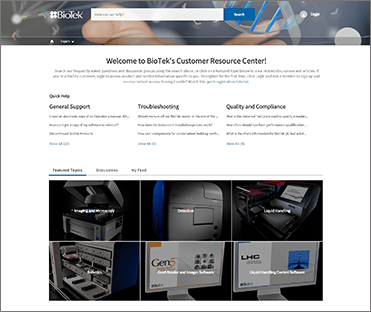 BioTek’s patented Hybrid Technology™ offers a modular platform to expand as your laboratory’s needs change. Top and bottom fluorescence intensity, UV-visible absorbance and luminescence detection are available. 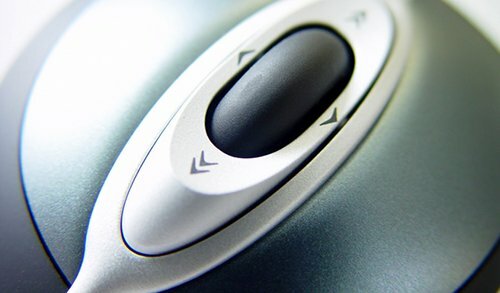 CO2/O2 control, dispensers, and temperature control are available. 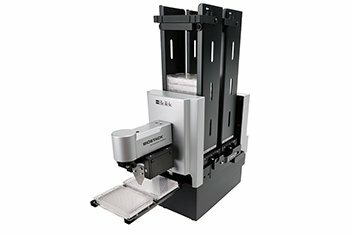 Synergy Neo2 Multi-Mode Microplate Reader with patented Hybrid Technology offers filter- and monochromator- based optics including multiple PMTs ensuring ultrafast, high performance in all detection modes. 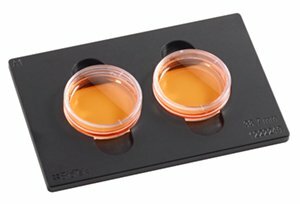 Live cell assays are fully supported with CO2/O2 control, incubation to 65 ºC, dispensers, and direct bottom illumination. 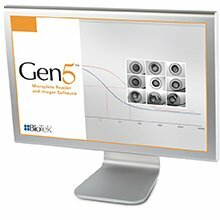 A set of resources are available for running the assays on the instrumentation described, including pre-configured Gen5™ software protocols, custom filter cubes, and User Tutorials that provide detail on the software parameters. These resources are shown by Table 1. Table 1. 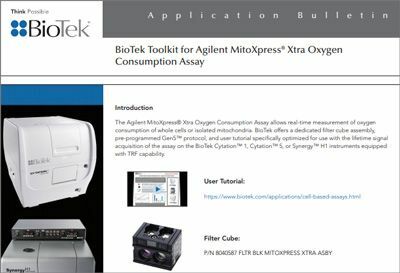 Links for accessing BioTek resources available for the Agilent MitoXpress® Xtra Oxygen Consumption Assay, pH-Xtra Glycolysis Assay, and MitoXpress® Intra Intracellular Oxygen Assay. Figure 2. 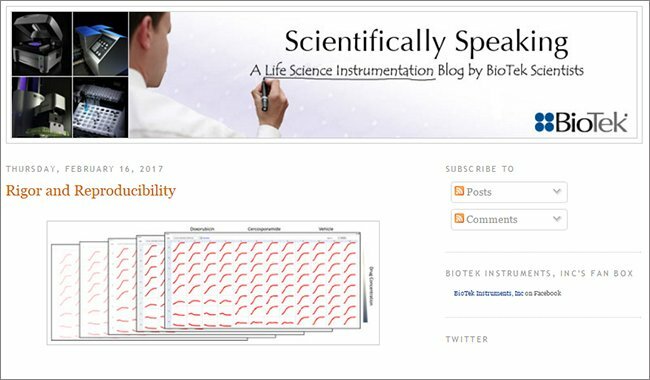 Map and reagent volumes for performing signal optimization of the Agilent probes on BioTek instrumentation. Signal optimization to validate detection gain and probe read height parameters is recommended before implementing live cell analysis. All methods used pre-warmed plates, media, and buffers. High sensitivity oil used for the MitoXpress® Xtra probe is prewarmed in a bead bath set at 37 ºC. Probes are reconstituted in 1 mL sterile water and assayed at RT. Compounds are kept at -20 ºC and brought to RT. The signal optimization procedure was run as defined in the User Manual with reagent volumes and well locations shown by Figure 2. The oil overlay is run for the Xtra probe only. The procedure was used to optimize gain for the probe signal in addition to validating lifetime read parameters, and kinetic time intervals for both full and partial plate reads. Results are shown using a Synergy H1 in standard TRF mode (Figure 3), and lifetime mode (Figure 4). Parameters for standard TRF mode include a 45 minute kinetic read with a 50 second interval between reads using TRF settings of 30 μs delay and 100 μs integration using an AutoGain on a high well with a scale of 60000. The high well was a GOx control without cells diluted in cell media containing probe. 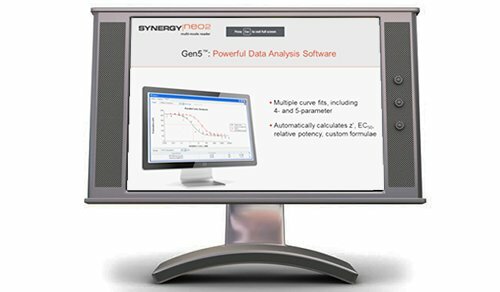 Results in Figure 5 are shown for the Synergy™ Neo2 using lifetime (μs) detection mode and parameters of 10 measurements/well (MW) at a gain value of 100 using BioTek's filter cube PN 1035123. Signal-to-background calculations for the top and bottom optics position on the Synergy Neo2 using the Xtra probe were compared by dispensing 12 replicates of 10 μL probe in 140 μL 20 mM glucose media to wells A1-A12 (PC), and 12 replicates of 140 μL 20 mM glucose media to wells C1-C12 (BLK) followed by a dispense of 100 μL of high sensitivity oil to all wells. 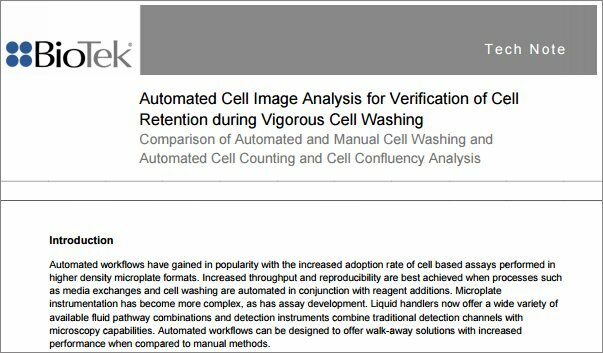 Signal optimization was performed using the volumes and reagents shown in Figure 2 with an AutoGain setting on a high well scaled at 60000 relative units. Using the volumes and reagents shown in Figure 2, a 45 minute kinetic read using the fastest interval time on a Synergy H1 was done at 30 ºC using lifetime parameters of a 100_30 and 300_30 delay and integration times respectively. Data is shown by Figure 9. HEK293 and HepG2 cells were cultured in DMEM supplemented with 10%FBS and 1% pen/strep/ glucose. Cells were trypsinized at 75% confluence and diluted with culture media to cell densities shown by corresponding Figures 6, 7, and 8. 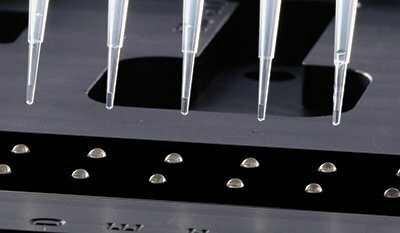 Cells were dispensed at 200 μL/well to 96-well microplates. The plates were incubated overnight at 37 ºC 5% CO2. The following day, media was aspirated, and 150 μL of pre-warmed probe in media stock was dispensed to each well and the plates placed on a plate heater pre-warmed to 30 ºC. 1μL of the following compound treatments were added to respective wells: 150x FCCP (two-fold serial dilutions 0-20 μM final); 150x Antimycin (two-fold serial dilutions 0-1 μM final); 150x Rotenone (1 μM final); and Phenformin (50 μM final). Blanks (150 μL media), Signal Control (15x probe in media), and PC (10 μL 15x probe, 10 μL 15x GOx (solubilized 1 mg/mL in 1 mL sterile water) to 130 μL media per well) were run on all plates. 100 μL of pre-warmed high sensitivity oil available in the assay kit was then dispensed to each well. Plates were read without lids. HepG2 cells were cultured in DMEM supplemented with 10% FBS, and 1% pen/strep/glucose. Cells were trypsinized at 75% confluence and seeded at 7 x 104 cells/well in 200 μL culture media then incubated ON at 37 ºC 5% CO2. On Day 2, probe was reconstituted 1:11 in culture media. Spent cell media was aspirated and replaced with 100 μL/well of probe in media stock, then incubated ON at 37 ºC 5% CO2. On Day 3, spent media was aspirated and cells were washed twice with Respiration Media. After the final aspiration, 150 μL of fresh respiration media was added to the wells. Controls were run on each plate as described for the Xtra probe, with the exception that no oil is added to the plate. 1 μL of test compounds were then added. A kinetic read was commenced at 37 ºC on a Cytation 5. Plates were read without lids. Data is shown by Figure 10. Figure 3. Assay window results in standard TRF mode. S/B_1 calculation is done for 0% O2/19% O2 and S/B_2 for 19% O2/Blank (no probe). Chemically induced 0% O2 is achieved using glucose oxidase (GOx). Figure 4. Comparison of lifetime signal stability for partial and full plate reads for MitoXpress® Xtra. The full plate kinetic interval of 1 m 39 sec resulted in a 0.0274/sec change in assay window, compared with 0.14385/sec in partial plate mode using a 20 sec kinetic interval. Lower interval times result in more data points, but higher interval times result in more stable assay windows. Although this data supports using either kinetic interval time, it is recommended that a kinetic interval that can accommodate a full plate, in this example a minimum of 1 min 39 sec, be used for all analyses regardless of how many wells are read. Figure 5. Comparison of top and bottom optics position on Synergy Neo2 (n=12) for each of the ‘dual’ lifetime TRF reads of the Xtra probe. 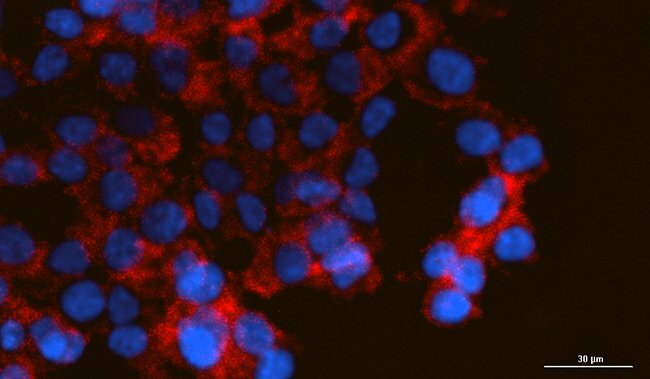 The extracellular assay requires an oil overlay. Results support that either optics position will produce similar signal response differentiation. As shown, the top optics position may result in less variability, and the bottom optics position in a wider assay window. Signal window can be further optimized by increasing measurements per well (mw) or adjusting the gain and/or probe read heights. Figure 6. 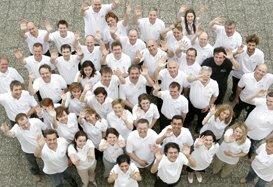 (A.) Cell density and inhibition optimization of HEK293 cells using Xtra probe and Oxygen Consumption Rate (OCR = MeanV RFU/min). 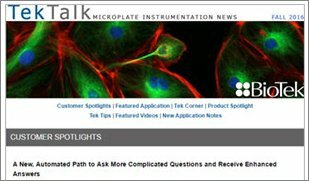 Cell growth rates should be considered and densities optimized for each cell line. HEK293 cells becomes non-linear at 100K cells/well in basal and FCCP treated cells. 1μM of Antimycin inhibits oxygen rates at all densities. Densities of 6 x 104 to 8 x 104 are optimal for this cell line. (B.) HEK293 cells seeded at 6 x 104/well and treated with a mitochondrial respiratory complex I inhibitor Phenformin (50 μM) results in a 10 fold decrease in oxygen consumption rate compared to untreated cells. Figure 7. (A.) Kinetic lifetime detection of extracellular oxygen consumption of HepG2 cells treated with uncoupling and inhibitor compounds at an interval of 2 min 19 secs. FCCP is a mitochondrial oxidative phosphorylation uncoupler that drives cellular respiration to a maximal rate increasing the depletion of oxygen. AntiMycin blocks cellular respiration via inhibition of complex III of the mitochondrial electron transport chain (ETC) resulting in low to no reduction of oxygen. Slope on lifetime was calculated from the linear portion (10-80 mins) of the 2-hour kinetic run for the OCR calculation. (B.) OCR profiling of the uncoupling and inhibition agents in comparison to untreated cells. Figure 8. Dose-dependent oxygen consumption rate (OCR) in HepG2 cells (70K/well) as calculated from Synergy Neo2 lifetime measurement from the linear portion (9:16 -130 mins) of a 3 hour kinetic run. AntiMycin inhibits oxygen consumption of HepG2 cells in a dose dependent manner. (Top) FCCP stimulation of maximal respiration is indicated at 2.5μM falling to below basal levels at higher concentrations indicating probable toxicity. Figure 9. (ABC) Lifetime signal reproducibility between full and partial plate reads for pH-Xtra probe on the Synergy H1 at 30 ºC over a 45 minute kinetic read using intervals of 1 min 39 sec (full) and 38 secs (partial). Using a default conversion function, pH is calibrated from lifetime values and H+ is quantified from pH. Extracellular acidification rate (ECAR) is calculated from H+ on average pH over the 45 min kinetic read. Kinetic interval time difference has little effect on results. It is recommended that a kinetic interval that can accommodate a full plate, in this example a minimum of 1 min 39 sec, be used for all analyses regardless of how many wells are read. Δ pH between expected and actual pH values are all <1.6% of the origin although slightly higher than within error range (+/- 1.5%). 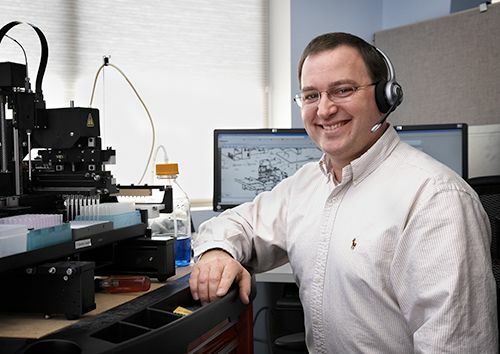 Delta pH can be improved by performing instrument specific pH calibration to adjust calculation variables. Glucose Oxidase (GOx) is a potent oxidoreductase enzyme and is used as a control for achieving maximal signal response from the Agilent probes. Lifetime profiles of GOx serial diluted 1:10 in respiration buffer (D.) converted to pH scale (E.) demonstrates the analogous relationship between probe signal change and acidification rate, where the highest glucose oxidase concentration (GOx 1) yields the greatest signal and acidification increase (red profiles GOx1). Figure 10. (A.) Lifetime detection of intracellular oxygenation of HepG2 cells in response to decreasing levels of applied O2 using a gas controller peripheral with Cytation™ 5 over a 3 hour kinetic time course. Cells were plated at 7 x 104 cells/well and read on Day 3. Oxygen levels were decreased at 40-50 minute intervals. (B.) Lifetime conversion to Intracellular O2 (%O2) is done using a first order exponential fit within Gen5 software. 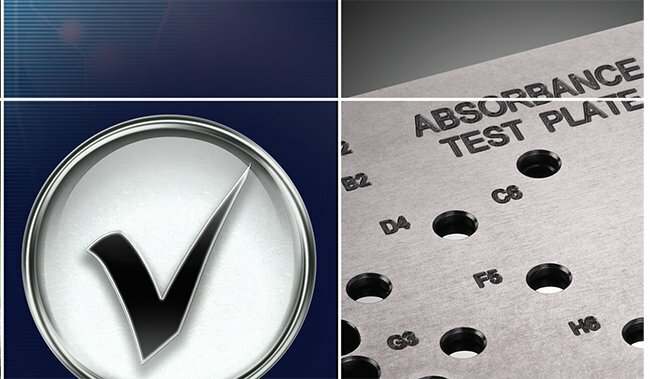 A set of customized calibration constants is used for the A1 and T1 values. 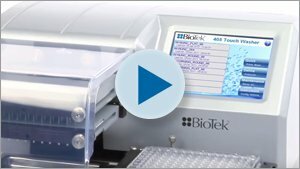 A protocol file that includes read parameters and calculations for performing this conversion is available from the Resources/Applications Bulletins tab at www.biotek.com https://www.biotek.com/resources/search. html?document_type=Application+Bulletins. 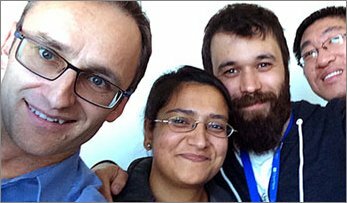 The sample protocol file can be adapted to independent experimental conditions using Gen5 version 3.04 or higher. We recommend using the calibration constants in the User Manual. Alternatively, using the same first order exponential fit function in combination with the gas controller for oxygen stepping, a user specific calibration function with new constants can be generated with support from Agilent. 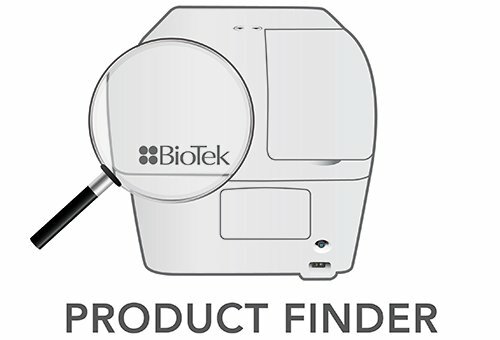 A variety of BioTek readers are compatible with the Agilent MitoXpress® Xtra Oxygen Consumption Assay, MitoXpress® Intra Intracellular Oxygen Assay, and MitoXpress® pH Glycolysis Assay reading in either standard TRF or lifetime mode, enabling diverse cellular metabolic studies. 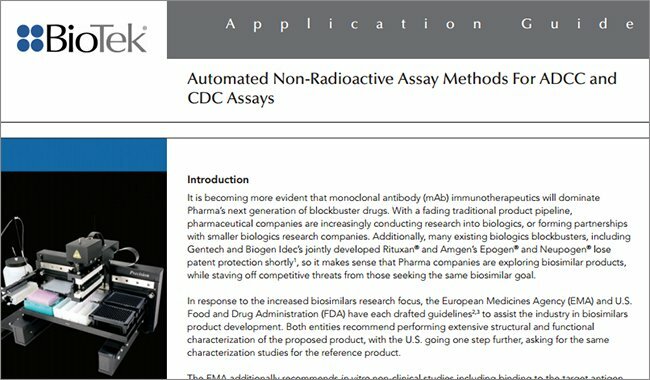 Signal acquisition of the Agilent probes using the BioTek lifetime detection algorithm is stable for kinetic interval times from 20 sec to 2:30 minutes, although it is recommended to run all assays using the same interval time. Detecting the pH probe in lifetime mode allows direct conversion of signal to pH scale and H+ quantification for ECAR analysis using a default conversion function. 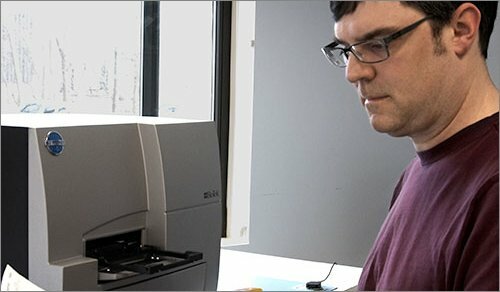 BioTek readers and Agilent probes are compatible for analyzing extracellular oxygen consumption rates and quantifying intracellular O2 levels in treated and untreated whole cells using the dual-read TRF measurement mode and subsequent conversion to lifetime values. Intracellular O2 concentration (%O2) can be directly calculated using a first order exponential fit in Gen5 software. Hynes James et al, ‘A high-throughput dual parameter assay for assessing drug-induced mitochondrial dysfunction provides additional predictivity over two established mitochondrial toxicity assays’, Toxicol In Vitro, 2012 Mar; 27(2):560-569. Hynes James et al, ‘Fluorescent pH and oxygen probes for the assessment of mitochondrial toxicity in isolated mitochondria and whole cells’, Curr Proto Toxicol., 2009 May; Chapter 2:Unit 2.16. Hynes James et al, ‘In vitro analysis of cell metabolism using a long-decay pH-sensitive lanthanide probe and extracellular acidification assay’, Analytical Biochemistry, 2009; 390:21-28. Hynes James et al, ‘Investigation of drug-induced mitochondrial toxicity using fluorescence-based oxygensensitive probes’, Toxicol Sci., 2006; 92(1):186-200. Martin D. Brand and David G. Nicholls, “Assessing mitochondrial dysfunction in cells”, Biochem. J. (2011) 435:297–312. Minh-Son To, Edoardo C. Aromataris, Joel Castro, Michael L. Roberts, Greg J. Barritt, and Grigori Y. Rychkov, “Mitochondrial uncoupler FCCP activates proton conductance but does not block store-operated Ca2+ current in liver cells”, Archives of Biochemistry and Biophysics 495 (2010) 152–158.